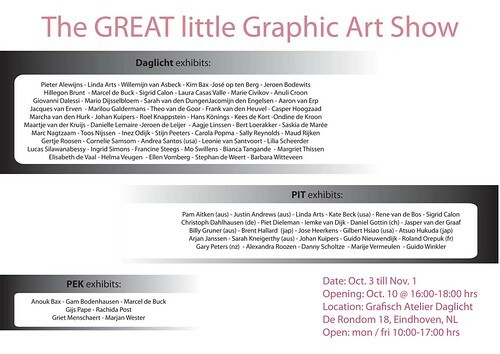 During the Dutch Design week this year, there will another great exhibition at Grafisch Atelier Daglicht, The GREAT Little Graphic Art Show. The exhibition is part of “de Maand van de Grafiek”, and is a collaboration between Grafisch Atelier Daglicht, artist initiative PIT and artist collective PEK. It features almost 100 artists, one of which is me. I will exhibit my most recent piece “Alien Landscaping #2” for the first time.